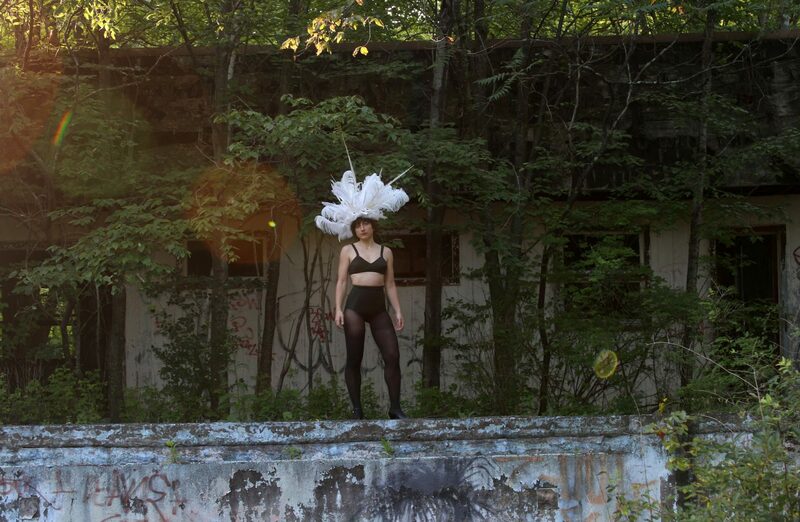 Performance artist Sacha Yanow’s “Cherie Dre” premieres next week at Danspace. Incorporating movement, text, music, and video, the narrative is set against the rise and fall of the cultural and material landscape of the Borscht Belt. Yanow spoke with Sasha Wortzel, the filmmaker who collaborated with her on video for “Cherie Dre,” about queer and Jewish inheritances, sacred ruins, assimilation, and the power of leisure. Their conversation has been edited for length and clarity. Sasha Wortzel: When did you first start to consider creating work about your family? Sacha Yanow: The last solo performance I made, “Dad Band,” was about my father: my actual dad and my relationship to patriarchy in general. I had a distant relationship with my dad growing up, and I had a really profound experience in making and performing that piece in terms of actual, real-life healing with him. It made me think: what in my relationship with my mother could benefit from that sort of deep dive? What’s the most icky part of what goes on in our dynamic? And I think it has to do with her relationship with her mother and the sort of severing of the matrilineal line. I knew my grandmother as a much older medicated person. So, I never really knew her. I came to learn that she had a kind of alter ego: a showgirl named Cherie Dre. And I was like, what in the heck? Who is Cherie Dre? And what was Cherie Dre doing for my grandmother, what did she allow for? I had also been interested in my Great-Aunt Florence’s story—my last remaining aunt from that generation, who’s 95 and lives in the Bronx. She was a dancer at the Copacabana and other places. And her sister, my Great-Aunt Alberta Kazansky, was a labor union organizer at the Concord and other Borscht Belt hotels. l started understanding where my grandmother’s construction of this alter ego could have come from: the Borscht Belt. Theirs was the first generation in my family to experience getting out of the Bronx and having a vacation, to experience that kind of expansion of one’s body and world. SW: [The show] is an interesting exploration of traumas that are passed down through generations, and how to do that kind of long-distance healing, backwards and forwards . . .
SY: I started to understand Cherie Dre as almost a—I don’t want to say escape fantasy, but something that had a usefulness to my grandmother: this survival technique that was passed down to my mother and then to me. So in a sense I’m literally trying to embody this thing, hopefully in order to release it but also to connect to my grandmother through our bodies. SW: What was your research process like? How did you find the raw material that became this performance? SY: It started as a research residency at the Cooley Gallery at Reed College in Portland, where I was asked to create a gallery installation of the piece. I had never done something without my body present in the space. So that launched me into deep research: books and oral histories of both my family and all kinds of old Jews that I met, people that used to be former waiters in the [Borscht Belt] hotels. I then spent two summers in Sullivan County, meeting everybody, like Jackie Horner, who was the head dancer at Grossinger’s for 30 years and who was a consultant on the movie “Dirty Dancing”—she’s the real life Penny. Literally being in the landscape of all the ruins of those hotels now. And meanwhile, having very, very cautious conversations with my mother and her brothers, trying to cull, mindfully and transparently, more information about my grandmother. And sitting through the reliving of trauma that my mom experienced from her mom, and that her mom was experiencing from her illness, or from the world. SW: And that is how we begin to heal, right? By reaching back to revisit those traumas, and trying to release them. SW: I’m thinking about this idea of channeling, the ways that you’re channeling your grandmother but also that world around her. And channeling, maybe, things from that landscape in Sullivan County that aren’t totally visible anymore. SY: Well, I’ve been thinking so much about that time period from the 40s to the 60s in the US—this phenomenon of Ashkenazi Jewish assimilation. Not only my family but for so many Jews, that moment of having just enough means to consider taking a vacation, and probably the desire to be included in luxury American culture at a time when “no Hebrews allowed” was the norm in most places. Or maybe not even luxury but just exploring joy and play and that sort of thing. This explosion of hotels and bungalows in Sullivan County—500 hotels and 50,000 bungalows—and all of them Jewish—that’s just bananas! Thinking about going from the Bronx to that extravagance and having it be all for them. I’m truly fascinated by that period and I think: what can that moment in time—the rise and fall of it and what the fantasy of it was—what can it show us about today? SW: How did you decide to incorporate video? And why were you drawn to working with me? SW: They could go to Florida! Which, is where my family went from the Bronx. As soon as they could. SY: Yeah! The landscape up [in Sullivan County] right now is so bananas because the hotels are in varying degrees of ruin and there hasn’t been much in the way of new industry or new immigration waves to come into that area and build it up again. And it’s literally an hour and a half from New York. I just find it fascinating that across the Hudson, in Hudson, New Paltz, Kingston, Woodstock, Catskills, there’s this art gentrification going on, but in Sullivan County, there’s just this enduring ruins-ness. The landscape is so stunning—it’s varying degrees of building collapse with wildflowers and trees growing out of it. I just found it beautiful. Almost like a sacred ground. Sullivan County is occupied Lenape land. The land has always been sacred, but there’s an element of like, my ancestors traversing it, which makes it particularly sacred to me. SW: It’s recorded in the landscape . . . it feels present. SY: It really felt important to capture this, not just some representation of it, but to capture it in actual video. I think we had been having a conversation generally about the piece and I was like, wait a minute . . . your work has a way of capturing landscapes—their layered, social histories, almost through the simplicity of really seeing them as themselves. It’s not heavy-handed, it’s like you really listen to the landscape, and it’s very beautiful. SW: I was so thrilled when you asked me to work on the project because everything about it is so in line with things that I’m thinking about in my work: ancestors, healing, landscapes. Layered histories that have been erased and are not recorded to the official historical record, and how we can create our own historical documents, our own archives to unearth these legacies. I’m really drawn to these in-between spaces like the ruins of the Concord Hotel or the Hudson River piers, these places that frequently aren’t assigned importance or value by dominant culture, and how those of us who are marginalized and looking for a sense of belonging engage in world-making in these spaces, how we occupy them. You know, I also had a really, really dear family member named Florence, who was my dad’s first cousin. She was probably the first queer person that I knew and understood as queer as a young child. I remember meeting her at my aunt’s wedding when I was eight or nine. She was wearing a gold suit and had red hair and was radiant on the dance floor and I just remember being so drawn to her. She and her partner met in New York City and then lived together in the Hamptons for 40 years. Once they both passed, I inherited all of their photographs and letters and ephemera, all the things that, on the surface, didn’t have monetary value but were deeply valuable to me. I made a point to go and save those things. SY: That’s actually why we were meeting to begin with. I was like, oh my god, you have photos of lesbians in the Catskills. SW: Yeah, exactly. I inherited an old slide projector and these boxes of slides and they’re mostly, I think, taken in the 50s and early 60s and many of them are of Florence and her queer friends in the Catskills. Working with you, I feel like I’m getting to connect to Florence, to my family, and getting a greater understanding of what that landscape meant to them. And that’s really valuable and beautiful to me. It was super compelling to have you introduce me to this place that I’ve never been but I feel so deeply connected to. When you’re there, you immediately feel the presence of all the bodies and stories that have passed through. And it was fun to try to think about how to see them again, to use the camera to see what’s not visible. And to bring that into your piece. SW: What can it do that you can’t already do? . . . One of the things I like about film is that it’s a form of time travel, it can collapse time and space. It records a moment and then the moment’s there forever. I was hearing from you or from the piece that we needed the ability to transport people in the room at Danspace to the ruins. To collapse that distance. To be on Second Avenue where all this Yiddish theater took place, which has all this deep Jewish history as well, and collapse that with this space upstate. There’s something really powerful about bringing the landscape into the space, to honor and meditate on that landscape. Sasha Wortzel shooting ruins at the Concord Hotel. Courtesy of the artist. SY: I want to go back to something you were saying about trauma: Cherie Dre is maybe born out of trauma but so is the Borscht Belt. That moment in Ashkenazi Jewish history—I mean, the Borscht Belt’s heyday in the 1940s is the same moment as the creation of the State of Israel. There’s this moment of trauma and then what it creates, a desire for ground. There’s something that I’m trying to think about for us, as Jewish people living today, around creating a sense of belonging inside diaspora, instead of on any geographic landscape. I wonder if you had thoughts about diaspora or trauma in landscape. SW: Yeah, I’ve been thinking so much about being a queer person in my 30s in New York City right now, and the inherited trauma of the AIDS epidemic. I think about being here now and not getting to connect directly to a whole generation of lost ancestors that my work is in conversation with and also the impact on the landscape itself. On the the bars, the bookstores, the restaurants, the Hudson river waterfront, the piers and thinking about HIV and AIDS and its entanglement with gentrification—something that Sarah Schulman writes about in Gentrification of the Mind. While distinct, I think there’s some resonance with having inherited trauma as an Ashkenazi Jewish person. Loss of place, loss of culture, loss of language, loss of our families. I love that you’re dealing with these ideas around diaspora as a Jewish person and also thinking about queer identity. SY: I feel like I’m trying to collaborate with my grandmother’s fantasy, [to integrate] my own experience and struggles with femininity, gender, desire. SW: That’s something that really resonated with me too because I’ve been so eager in my work to collaborate with these people who are no longer here. Like Marsha P. Johnson, or more recently, Nelson Sullivan, who was a queer nightlife documentarian, who brought his camera everywhere and recorded the city around him. He created and left behind this amazing archive of a past New York City. How can I continue to collaborate with him or with others, to do this process of recording, of writing something down? Not just to purely document its existence but also to transform our relationship to it. SY: It’s also a collaboration with the Borscht Belt. Being up there in the ruins, in the energy that remains. I’ve been thinking a lot about absence . . . there’s an absence of my grandmother in my story. Just like there’s an absence of all those hotels upstate. But within that is such richness, the richness of the remains in the absence . . . There’s a power there. There’s a place of surrender and beauty. “Cherie Dre” will play at Danspace Project, St. Mark’s Church, 131 East 10th St, New York, NY, October 25th-27th, 8pm. Advance tickets, $22 or $25 at the door, pending availability. Sacha Yanow is a NYC-based performance artist and actor. Her solo performance works use personal and familial history as a starting place to talk about broader social and political questions, and have been presented by venues including Joe’s Pub and New Museum in NYC; PICA’s TBA Festival/Cooley Gallery in Portland, OR; and Festival Theaterformen in Hanover, Germany. Sasha Wortzel is an artist and filmmaker living and working in New York City. Blending documentary techniques and fictional narratives, her work in film/video, installation, and performance explores how structures of power shape our lives around race, gender, sexuality, and place.